This cool space wallpaper shows the Gemini Observatory which consists of twin 8.1-meter diameter optical/infrared telescopes located on two of the best observing sites on the planet. 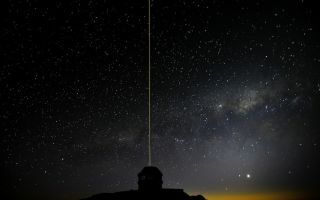 From their locations on mountains in Hawai‘i and Chile, Gemini Observatory’s telescopes can collectively access the entire sky. Gemini was built and is operated by a partnership of seven countries including the United States, United Kingdom, Canada, Chile, Australia, Brazil and Argentina.